Today, it’s all about single-minute exchange of dies (SMED), and a fast efficient machine setup impacts your bottom line. Take a minute to see what MPI is doing to improve machine setup times. Now you can accurately fasten a die to a press in as little as 60 seconds. This simple mounting process allows for rapid hydraulic clamping of the die to the platens. Alignment of the nozzle and die is achieved at the same time. The central location for access to all machine parameters. 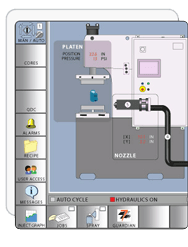 Machines supplied with an OIT (Operator Interface Terminal) provide the operator with a single location for automatic setup of a wax die, and process control of the injection cycle. 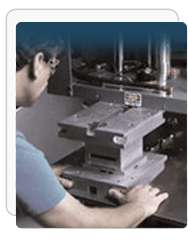 MPI’s Smart Systems with Process Control simply allows for the rapid die changes from a stored “recipe.” This results in significantly less setup time and consistent throughput from setup to setup of a die. The motorized nozzle will automatically move the nozzle to the ideal position to achieve the most direct wax flow path and optimum pattern fill. This is accomplished utilizing the stored program recipe for the die. Everything at MPI is engineered to minimize transition times and maximize throughput. Our unique jib crane design allows quick and safe changeovers of wax dies by a single operator. This results in reduced set up times and a more efficient use of manpower. Our hydraulic shuttle table provides smooth movement in and out of the press rapidly and efficiently. The comfortable height allows the operator to remain on the floor during die setup and pattern removal. Machines can be designed with two shuttle tables with programmable nozzle positioning which allows two different size dies with different injection programs to be run automatically from each dies stored injection recipe. Machines can also be designed with custom worktable layouts to optimize efficiency.